Make the desk more welcoming with our custom pen tray. Keep pens and nick knacks safe from rolling away, this stylish pen tray can be personalised to feature your favourite photos or designs. With a dish, you have room for erasers, paper clips or pencil sharpener. Keep it tidy with our unique and exclusive Bags Of Love pen tray. Space for a number of pens and pencils, paper-clips and general desk material. High quality, strong and durable designer pen tray. For the discerning desk hermit, artist, designers or office workers. 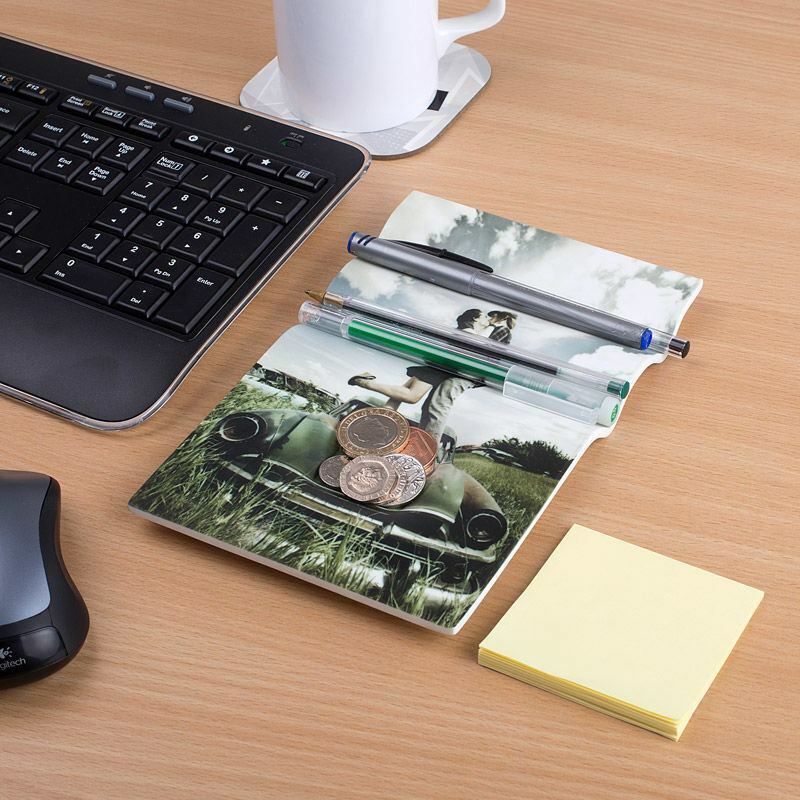 Whether at home or office, it is so important to keep your workspace tidy - tidy desk, tidy mind! Our personalised pen tray is ideal for storing pens and pencils and any odds and ends such as erasers, sharpeners and paper clips. It makes a great personalised gift for someone who spends a lot of time in the office...or just someone who likes to be organised. I ordered six different items and they were all really good. The glasses case and cloth were particularly impressive. The tea caddy was a bit small but all the photo reproductions were excellent quality on everything and it all arrived within a matter of days. I would definitely use Bags of Love again. The products look great. However my order was sent to my billing address instead of the address I specified which caused a few issues. Your design is printed onto the photo pen tray using a high-tech digital printing technique, which trained technicians carry out in our bespoke London facility. Your printed design fades subtly over the edges giving a 3D wrap effect to your photo pen tray without a clear-cut line when your design ends. Craftsmen mould the photo pen tray into the unique shape which gives you ridges for pens as well as a recess for storing things such as paperclips. As well as being extremely useful, this fun pen tray also helps make your workspace more personal. By uploading a favourite photo or design, you can bring your treasured memories to work with you, in a way more fun way than a photo in a frame! Use your favourite picture from the Christmas party. Leave a message for your colleagues who are prone to pinching a pen or two, or even use a family photo so that you can feel like they are always with you even when you are at work. There are so many things that you can do with this photo pen tray it's almost unbelievable.